APT Made in USA. 1-1/4" Cutting Diameter x 2-1/8" LOC x 1-1/4" Shank, Dyna-Mill Indexable End Mill. Triangle Inserted, Negative Rake, 90 degree Cut. Uses TNMG Inserts. Click on "more info" for tool details. APT Made in USA. 1-1/2" Cutting Diameter x 2-1/8" LOC x 1-1/4" Shank, Dyna-Mill Indexable End Mill. Triangle Inserted, Negative Rake, 90 degree Cut. Uses TNMG Inserts. Click on "more info" for tool details. APT Made in USA. 1-3/4" Cutting Diameter x 2-1/8" LOC x 1-1/4" Shank, Dyna-Mill Indexable End Mill. Triangle Inserted, Negative Rake, 90 degree Cut. Uses TNMG Inserts. Click on "more info" for tool details. APT Made in USA. 2" Cutting Diameter x 2-1/8" LOC x 1-1/4" Shank, Dyna-Mill Indexable End Mill. Triangle Inserted, Negative Rake, 90 degree Cut. Uses TNMG Inserts. Click on "more info" for tool details. APT Made in USA. 2-1/2" Cutting Diameter x 2-1/8" LOC x 1-1/4" Shank, Dyna-Mill Indexable End Mill. Triangle Inserted, Negative Rake, 90 degree Cut. Uses TNMG Inserts. Click on "more info" for tool details. APT Made in USA. 2-3/4" Cutting Diameter x 2-1/8" LOC x 1-1/4" Shank, 3 flute, Dyna-Mill Indexable End Mill. Triangle Inserted, Negative Rake, 90 degree Cut. Uses TNMG Inserts. Click on "more info" for tool details. APT Made in USA. 3" Cutting Diameter x 2-1/8" LOC x 1-1/4" Shank, Dyna-Mill Indexable End Mill. Triangle Inserted, Negative Rake, 90 degree Cut. Uses TNMG Inserts. Click on "more info" for tool details. APT Made in USA. 4" Cutting Diameter x 2-3/4" LOC x 1-1/4" Hole, Dyna-Mill Indexable Face Mill. Triangle Inserted, Negative Rake, 90 degree Cut. Uses TNMG Inserts. Click on "more info" for tool details. APT Made in USA. 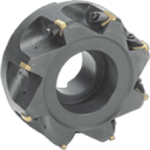 5" Cutting Diameter x 2-3/4" LOC x 1-1/2" Hole Size, Dyna-Mill Indexable Face Mill. Triangle Inserted, Negative Rake, 90 degree Cut. Uses TNMG Inserts. Click on "more info" for tool details. APT Made in USA. 6" Cutting Diameter x 2-3/4" LOC x 2" Hole Size, Dyna-Mill Indexable Face Mill. Triangle Inserted, Negative Rake, 90 degree Cut. Uses TNMG Inserts. Click on "more info" for tool details. APT Made in USA. 8" Cutting Diameter x 2-3/4" LOC x 2-1/2" Hole Size, Dyna-Mill Indexable Face Mill. Triangle Inserted, Negative Rake, 90 degree Cut. Uses TNMG Inserts. Click on "more info" for tool details.